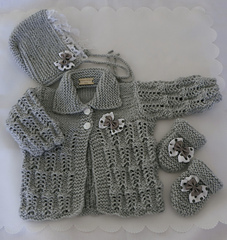 Pattern gives instructions to knit the matinee style baby cardigan, bonnet and mittens. A lovely to knit pattern with a vintage feel. The pattern consists of a long sleeved matinee styled cardigan with a knitted collar featuring an eyelet lace pattern. The bonnet and mittens are knitted in garter stitch. 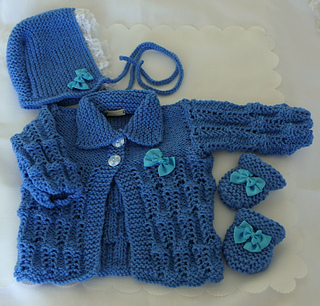 The pattern is worked flat on two needles and the pattern gives instructions to knit the outfit in sizes 0-3 Months and 3-6 Months. The two sizes are achieved by using different sized needles. Once knitted the outfit is also suitable for life-size reborn dolls 19-21in. The grey set shown is knitted in James C Brett Double Knit with Merino and the periwinkle outfit is knitted in Stylecraft Special DK. I have also successfully knitted the set using King Cole Cherish. You will also require an 18in long piece of 1 inch wide lace and 4 fabric bows.